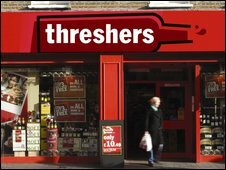 First Quench, the owner of Threshers, The Local, Wine Rack, and Haddows, has gone into administration. Administrators KPMG will look to save "as many jobs as possible" by selling the business as a going concern. All stores will stay open and all the company's 6,500 employees will be paid as usual next week, they said. The company had been looking at various ways of restructuring the business to avoid administration as it struggles during the recession. It has suffered from increased competition from supermarkets, and from stock problems earlier this year. It said it had been unable to warn staff of the move to call in KPMG. "It is with great regret that the board was not able to brief our colleagues prior to [the announcement] being made public," the company said. "This was always our intention but, unfortunately, the news leaked. There is a full programme of communication which will commence from Friday morning to our colleagues," it added. On Wednesday, First Quench released a statement saying that "it is no secret that the credit crunch has made a very competitive marketplace even more challenging." "The board, in consultation with its advisers, has been actively considering a number of restructuring and strategic options for First Quench and any decision will be made in the best interests of the business and its stakeholders." First Quench has 1,300 stores under its various different brand names.